Soulful alternative pop singer-songwriter JANELLE KROLL is sharing a powerful message with the debut of a mesmerizing, entirely CGI-animated music video for her latest single, “Walk With You,” making its official wide release today, July 20. The 3D motion capture video, co-directed by KROLL and a team of talented artists in collaboration with Apple Music, was first made available as an exclusive release and “Featured Video” on Apple Music. Watch “Walk With You” now HERE. “Walk With You” is a gripping, raw, and hopeful love ballad in the form of one open-ended vow. Here, KROLL‘s music takes on a more elemental approach than usual, anchored by atmospheric piano and a lush build of background vocals with a subtle heartbeat on the chorus. The song was produced byKROLL herself alongside fellow NYC artist/producer J.Views. 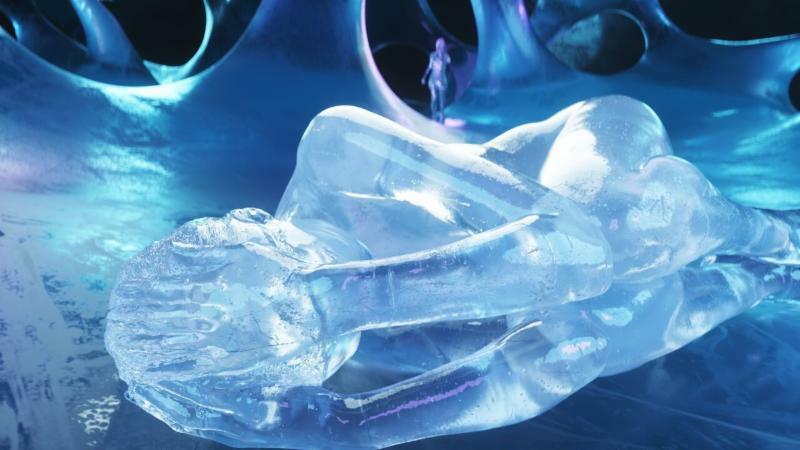 In the video, JANELLE is seen as a melting ice sculpture reaching toward another female ice sculpture, defying the laws of physics in the style of magic realism as they both melt and unite. While exploring eternal love and impermanence and emphasizing a queer relationship, the video also serves as a striking metaphor for climate change. Inspired by recent reports in bothThe New York Times and The Washington Post that Antarctica’s ice sheet is now melting three times as fast as a decade ago, JANELLE has partnered with The Nature Conservancy to encourage the public to become involved in aiding this crisis. She is donating a portion of her “Walk With You” revenue and has launched a dedicated fundraising campaign at www.nature.org/walkwithyou. “By posing sculptures in the place of icebergs, the video humanizes the imminent threat of glaciers melting and the devastating impact rising water levels will increasingly have on our civilization as a result of our own undoing,” KROLL shares. For this video project, JANELLE brought together a team that included lead animator David Ariew, co-director/art director Laura Wass and co-director Owen Brown. Ariew has worked on visual and 3D effects for Katy Perry, Deadmau5, Taylor Swift, Justin Timberlake and Westworld, and as a member of the visual effects team that won an Oscar for their work on the film King Kong (2005). This marks the first music video for co-director/art director Laura Wass, who’s known for her avant-garde jewelry line WXYZ Jewelry. She created the iconic headpiece on Childish Gambino’s album cover for“Awaken, My Love!” and her jewelry has been worn by Beyoncé, Janelle Monae, and Erykah Badu, among others. Co-director Owen Brown’s full-service creative studio CTRL5 produced the video. Chicago-born, New York-based singer-songwriter Janelle Kroll shapes her individually crafted songs through her powerful use of human emotions and real-life sentiments. She developed her singing and songwriting chops through various creative partnerships, including her time singing lead vocals while on tour with indietronica outfit Big Data (summer 2014) as well as a co-writing credit with Estelle on “Time Share (Suite 509)” (True Romance, 2015). Her 2015 hit, “Sunny Days,” was featured on Spotify’s influential New Music Playlist and went Top 10 on the streaming platform’s US Viral Chart and Global Viral Chart. Further backed by ongoing support from tastemaker media outlets like Harper’s Bazaar, Billboard, Pigeons & Planes, and more, Kroll secured a coveted performance slot on internationally celebrated music festival Lollapalooza in her native Chicago in 2015. Her latest EP release, 2017’s Pretty Lie To Me, sees Kroll defying genre boundaries and artistic expectations while traversing through a wide array of kaleidoscopic sounds: trip-hop attitude, R&B sensuality, electronic-kissed soul, downtempo delicacies, indie dreamscapes, future pop airiness, neo-R&B and funk grooves, alternative pop and beyond. Kroll freely explores the definitive themes surrounding her personal life-emotional authenticity, impermanence, independence-to produce her self-created notion of “dependent music,” a connection with listeners bridged solely by the raw emotions and emotional dependencies we all share as humans. We would like to thank Angela Moreno from RECKONING PR for the artist profile and press release.